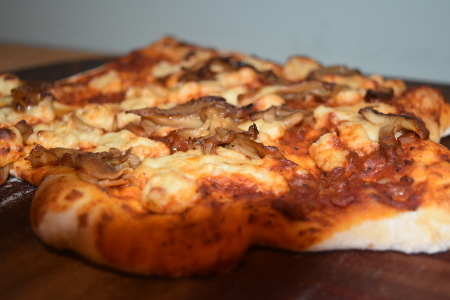 The rich flavour of wild mushrooms makes this Vegan Pizza Funghi exceedingly delicious. Although the vast majority of my vegetarian and vegan friends are thoroughly fed up with being served mushrooms everywhere they go, using dried porcini mushrooms and fresh wild mushrooms means that the mushrooms are the star of the show, and not just a poor man’s alternative to meat! I thought I’d try and make this pizza recipe a little bit classy; with the addition of a porcini and white wine jus, I’d say the vegan pizza funghi is sophisticated enough for dinner parties! However, the real reason for making a jus is to add to the delicious intensity of the wild mushroom flavours, making sure that this pizza is truly tasty. Similarly to my Vegan Pizza Margherita recipe, this recipe is made entirely from scratch – base, sauce and toppings included. Although not a necessity, I’ve also included my vegan mozzarella recipe; I personally think this adds to the pizza, but seeing as the mushrooms are the main flavour here, it’s possible to enjoy a vegan pizza funghi without it. You do need a barbecue with a lid to create the oven environment required for pizza, along with heat deflector stones and a 2nd tier grill if possible if you’re using a ceramic barbecue. If you’re using a Grillson then you don’t need the extra grill or heat deflector stones, just the pizza stone. Makes 3 medium sized pizzas. Prep time: 1h 30 minutes. Cooking time: 45 minutes (10 minutes for each pizza, plus 15 minutes for making the mushroom jus). 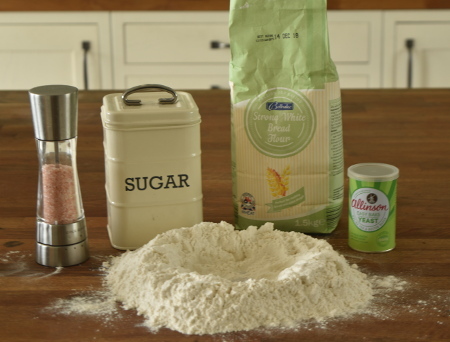 Pour the flour out onto a clean work surface and create a well in the middle. Make sure the walls of the flour are consistent (with no gaps!) all the way around the well so that no water can seep out. Gently pour about half of the warm water into the well, then add in the yeast and sugar - give this a quick mix together with a fork before adding the salt and mixing a little more. Use the fork to gently push bits of flour into the well and mix it into the warm water mixture. Make sure that you maintain the flour walls to stop water escaping! 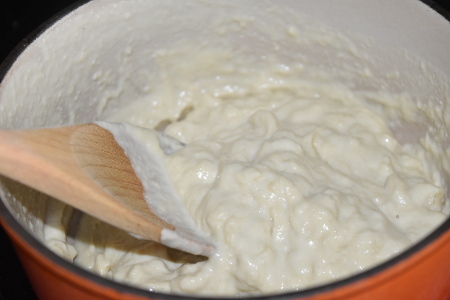 Once the mixture in the middle has thickened up to a gloopy consistency, add the remaining water bit by bit while more confidently combining it with the flour to thicken the dough. Once you’ve added all the water, use your hands to push in the remaining flour and combine until you have a not-too-sticky ball of dough. Of course, if the dough is really sticky then go ahead and add more flour, whereas if the dough feels dry and isn’t sticking together well, add a touch more water. Knead the dough for a good few minutes (about 5 should do), until it’s stretchy and smooth. You’re doing it right if you’re working up a sweat! Pop the ball of dough into a large bowl and cover with cling film, before putting it in a warm place to prove. I use the plate warming drawer of my oven which seems to work well enough, as long as you keep it on a low temperature. Leave it for 30-45 minutes, until doubled in size. While you’re waiting for the dough to rise, it’s time to make your tomato sauce. Put the olive oil into a pan and add the onions, putting it onto a medium heat – olive oil has a low smoking point, so it’s important not to raise the temperature too high. Once the onions are beginning to soften, add the garlic and sundried tomato, followed by the tomato purée, chilli flakes, dried basil and dried oregano. Add the passata and season with salt and pepper. Because passata is quite thick, you don’t need to reduce it for long at all; the flavours should already be beautiful and intense. If you prefer a smooth sauce, then allow the sauce to cool before blending it using a hand blender. Now it’s time to make the vegan mozzarella - a great addition to your vegan pizza funghi. Begin by putting your cashews into a microwavable container, covering them with 360ml (1½ cup) water and microwaving them for 10-15 minutes to soften them. Pour the cashews AND the remaining water that they were boiled in into a blender or food processor, alongside the remaining 360ml (1½ cup) water, tapioca starch, nutritional yeast, lemon juice, salt and garlic powder. Blend until smooth. Pour the mixture into a small to medium saucepan, and turn it up to a medium heat. Pour the mixture into the pan and stir continuously – you will soon notice the mixture starting to clump, and after about 5-10 minutes you’ll end up with a big lumpy blob (I don’t that doesn’t sound appetising but trust me it’s tasty!) of gooey cashew cheese in the middle of your saucepan. When you reach this stage, turn off the heat. I prefer to leave the cheese less firm, as this makes it easier to spread across your vegan pizza funghi. Start making the jus by putting the tablespoon of olive oil in a frying pan along with the dried porcini mushrooms. Put the pan onto a medium heat and gently fry. After a few minutes, add the garlic and wild mushrooms, continuing to gently fry them until they soften. After around 10 minutes, pour in the soy sauce and white wine; stir and allow the liquid to reduce down. Once the sauce has thickened, take the pan off the heat. Place a sieve over the top of an empty pot/saucepan/gravy jug and pour the mushroom sauce into it. Use the back of a spoon to squeeze as much moisture out of the mushroom mixture as possible, leaving a silky smooth jus in the pot below. Please note that there won’t be masses of jus – there will be just enough to drizzle over your pizza. Put the mushrooms left in the sieve aside – we’ll need those to top the pizza! If you are happy with the jus then you’re ready to assemble the vegan pizza funghi – if you reckon it’s too thin then you can pour it back into the saucepan and reduce it down further until you’re happy with the consistency. It’s now time to light the barbecue. You really need to get in up to a high temperature, about 350°C (662°F), so be patient and make sure that your barbecue (with pizza stone!) has properly warmed through before cooking. 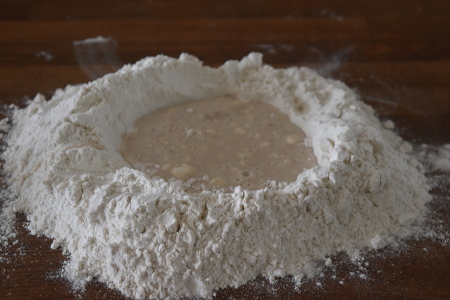 Take the dough out of its warm place (if you haven’t already), and put it onto a floured work surface. Knock the air out of it by bashing it around a bit, then tear off about a third of the dough. Roll out the portion of dough you’ve taken, making a round-ish shape. It doesn’t have to be perfectly round – I personally think that an asymmetrical pizza is more endearing than a perfectly circular one! I prefer a thickness of about 0.2cm, (about 0.1 inch). When your dough is your desired shape and thickness, take a good few tablespoonfuls of the pizza sauce and spread it around the pizza with the back of your spoon. Make sure you don’t put your sauce on too far in advance, otherwise your pizza is likely to go soggy. It’s also worth noting that if the layer of sauce is too thin it will just dry out on the barbecue. Take little chunks of your vegan mozzarella and spread them around your vegan pizza funghi. Make sure there is a good coverage of the mozzarella on the pizza, because it doesn’t melt like normal cheese, so needs to resemble the distribution of normal cheese after it has melted. 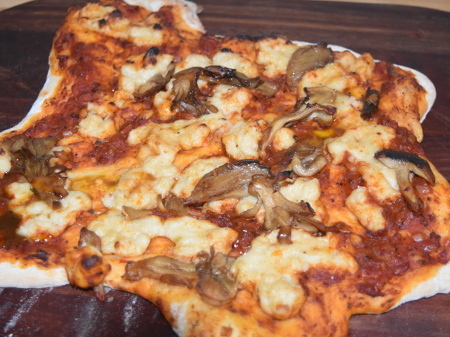 Spread your cooked wild mushrooms across your pizza, but NOT the jus - this is added after the pizza is cooked. 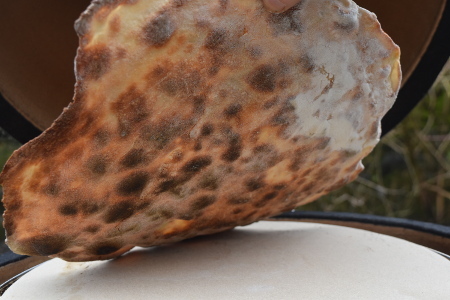 Sprinkle a little bit of flour onto your pizza stone, then use a pizza peel to scoop up your vegan pizza funghi and pop it onto the pizza stone on your barbecue, closing the lid as soon as possible to keep the heat in. Cook one pizza at a time, for around 10 minutes each. This is where your judgement comes into play, because a thicker pizza base will require a longer cooking time, whereas a very thin pizza base may cook in as little as 5 minutes! When your vegan pizza funghi has started to brown in a leopard skin pattern on the bottom, take it off the barbecue. Add any extras you like (for example fresh rocket leaves), then drizzle your mushroom and white wine jus over the top. And there you have it - delicious vegan pizza funghi! Enjoy! I absolutely love Asian cooking. Sweet and sour tofu stir-fry just happens to be one of the dishes I love to make the most, and it tastes even better made on a barbecue.